Whether it’s Outback’s Bloomin’ Onion or In-N-Out’s secret sauce, the Internet is awash with bloggers’ attempts to recreate iconic foods. Regrettably, as the occasional DIY fail can attest, not all reproductions are indistinguishable from the original. But this isn’t the case for neuroscientist Kristin Baldwin. She and her team have successfully decoded one of the most difficult and baffling recipes of all—how to make neurons. The Baldwin group’s latest discovery, by researchers Joel Blanchard and Kevin Eade, builds upon the increasingly popular method of direct reprogramming: a process that directly converts one cell type into another. For decades, this procedure was scifi fantasy; today, it’s an accepted technique. As Eade explains, “Every cell in your body has the same bit of DNA. It’s how that particular cell reads the DNA that makes it a different type of cell.” During normal development, diverse cell types are created as certain factors trigger these cell-specific instruction manuals. Direct reprogramming seeks to co-opt those factors, and thus artificially change a cell’s identity. The allure of direct reprogramming is that human skin cells (which are easily collected) can now become any other cell type in the body; all that’s needed are the specific reprogramming factors that initiate genetic programs for each unique cell type. Photoshoot in the Baldwin Lab! 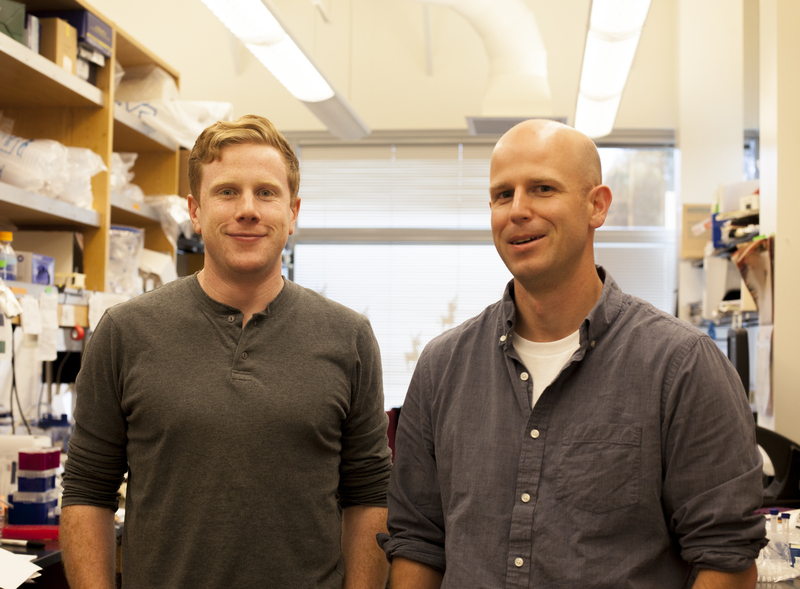 Our intrepid neuroscientists, Kevin Eade (left) and Joel Blanchard (right). Since 2010, after the first successful conversion of skin cells into neurons,1 scientists have been scrambling to identify the codes for specific (clinically relevant) subtypes of neurons. In a recent Nature Neuroscience publication, the Baldwin Lab describes reprogramming factors that can convert skin cells into peripheral sensory neurons—the cells responsible for the sense of touch.2 With their reprogramming protocol, the induced sensory neurons (iSNs) look and behave much like normal sensory neurons. Besides developing the typical neuronal shape, iSNs produce the correct proteins and maintain proper electrical activity. Chemical tests even demonstrate that iSNs possess the appropriate pain, temperature, and itch sensors, and can respond accordingly. Even so, iSNs in a dish don’t have the same rich environment as sensory neurons do in the body, and as such, may not be molecularly identical replicas. To analyze potential discrepancies between reprogrammed cells and their real-life counterparts, one laboratory developed an algorithm called CellNet (“like Terminator’s Skynet,” Blanchard offers as a mnemonic). Results from CellNet suggest that directly reprogrammed cells retain subtle characteristics of their former cell type.3 For iSNs specifically, Blanchard concedes that a few differences are likely. Given that the iSNs aren’t interacting with other cell types (they’re alone in the dish), they probably don’t develop the communication machinery that’s normally used by sensory neurons. Therefore, iSNs can’t be indiscriminately used as a proxy for real sensory neurons. Still, for many applications, iSNs are functionally indistinguishable from their natural counterparts. So what exactly can you do with a Petri dish full of iSNs? Well, the most medically relevant aspect of iSNs is that they respond to pain! Testing pain relievers on iSNs could be a supplementary (and potentially more effective) method of drug screening. A number of promising analgesics, although successful in rodents, have failed in clinical trials.4 Besides the obvious differences between rats and humans, one reason for this inconsistency could be our inherent genetic diversity. Because inbred animals are less genetically variable, so too are their responses to drugs. Animal models can’t explain why some people respond to certain medications, while others do not. Blanchard suggests that to really “identify that diversity, you need a system where you can study the neuron in the proper genetic context.” Which is where iSNs come in. 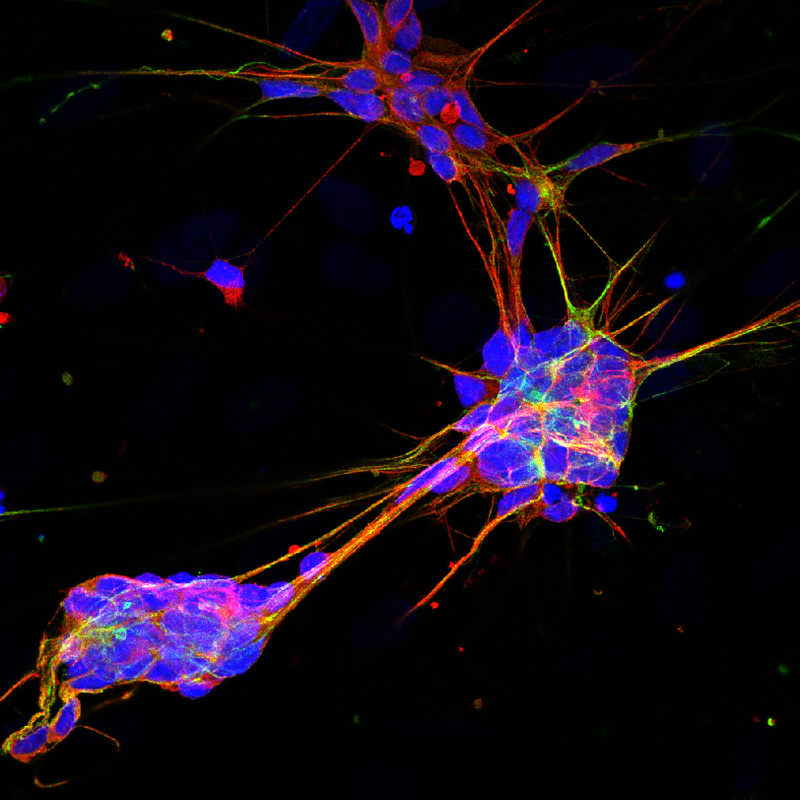 When life gives you skin cells… make sensory neurons! Remember, an iSN that was derived from your skin cells has the same DNA as the rest of you. Eade explains that “[an iSN is] not only a human neuron—it’s a neuron from a particular person. So now we can study your neuron in a dish.” Furthermore, if scientists collect skin cells from a variety of patients, direct reprogramming can be used to generate a whole library of human neurons. This would more fully represent the genetic diversity seen in real life, and could help researchers predict drug efficacy more accurately (or even on an individual basis). 1. Chin MT. (2014) Reprogramming cell fate: a changing story. Front Cell Dev Biol 2:46. 2. Blanchard JW, Eade KT, Szűcs A, Lo Sardo V, Tsunemoto RK, Williams D, Sanna PP, Baldwin KK. (2015) Selective conversion of fibroblasts into peripheral sensory neurons. Nat Neurosci 18(1):25-35. 3. Cahan P, Li H, Morris SA, Lummertz da Rocha E, Daley GQ, Collins JJ. (2014) CellNet: network biology applied to stem cell engineering. Cell 158(4):903-15. 4. Berge OG. (2011) Predictive validity of behavioural animal models for chronic pain. Br J Pharmacol 164(4):1195-206.